Summer is the time to refresh, rejuvenate, and reinvigorate our teaching! While you're laying out next to the pool this summer, download one of our favorite new apps: Educreations. 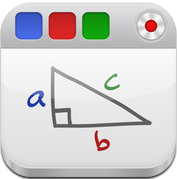 With the recent trend of creating Flipped Classrooms, this app makes screen casting a breeze. A white board app with the ability to embed images and record audio, Educreations is essential to any teacher looking to spend their summer creating resources for a newly Flipped Classroom. Assess mastery by having students narrate their answer to a multiple choice question targeting a specific skill. They can use the whiteboard tools to illustrate their rationale. Click HERE for examples. Social Studies: Have students narrate and annotate an image of a map as they point out key geographic features of a particular country or civilization. Language Arts: Have students draw a bubble map to describe the traits of the main character and then narrate their thoughts about a character's credibility. Math: Have students work to solve a problem, narrating the steps and strategies they use to reach their solution. Science: Have students draw a diagram to illustrate the water cycle and narrate the process as they draw.